But back to the problem. 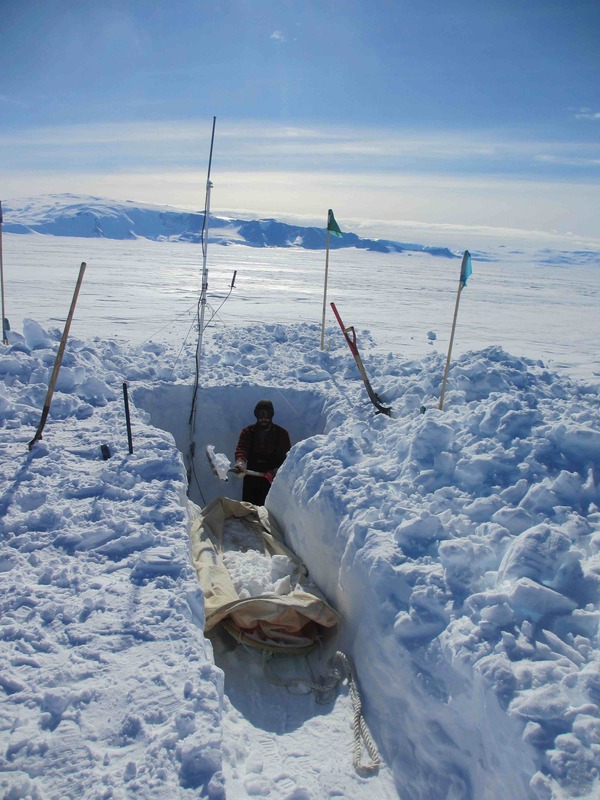 So we heroically excavated a huge amount of snow to find a station at the bottom of the hole. Thankfully, someone had taken a picture a couple of years before, so we knew where to dig. Thankfully, no one has taken a picture of station 10, which we will have to do tomorrow. That will be great. I will let you know! What else has improved with the weather? Well, from my perspective, getting rid of fluid has gotten less annoying. Peeing in a bottle with a little funnel is fun enough, if you are not wearing anything. But try it when being dressed up as like Michelin person with four layers and every single bit of exposed skin will be extremely cold within a couple of seconds. No wind and sun, lets you already reduce the problem to three layers and you can afford a couple of seconds of bare skin without immediately deciding to never have to pee again while you are here. I have also now learned about the wonders of ECW (extremely cold weather gear) pants. You can take the behind of without taking off your suspenders, so your front is still warm while you can safely use the bathroom tent. "Bathroom tent" makes it sound extremely fancy, but actually it is just a tent in the most classical sense (one pole in the middle) with no floor and a box with a bucket in it. Mind you, this is only for solid remains as otherwise the buckets will become too heavy and full too soon. So using the bathroom turns into a sequential procedure. First the bottle then the bucket. The bottle then goes in a big barrel ("grey water barrel" as also our dish washing water goes there) while the bucket stays to be used until it gets changed by the end of the week. You never wanted to know that? Well, me neither but that is how this goes. Another fun fact is that all pee bottles are old drinking bottles and most of them have a scale on the side, which was probably once intended to measure you fluid intake. Well, you can now also measure fluid "outtake". And I have learned that my bladder can hold more than a liter. But let's not go further into detail here. Another aspect of the nicer weather is that sleeping in the tents now really has the camping experience. Even though, the sun never sets, it gets very low at night, meaning that it is a little colder. So, when you wake up in the morning, your tent has turned into a sauna. Well, there is still some iced over condensation so it might not be a real sauna, but when you are in a double lined sleeping bag, equipped to be good to something like -25 degrees, 0 degrees in your tent are incredibly hot. So, how everyone knows from camping at home, the temperatures drive you out of the tent. And when you can climb out without being hit by a snow storm the mornings are looking less grim. Of course, we also do not have to defrost the generators every day and dig out our tents every night. But that is almost not even worth mentioning. 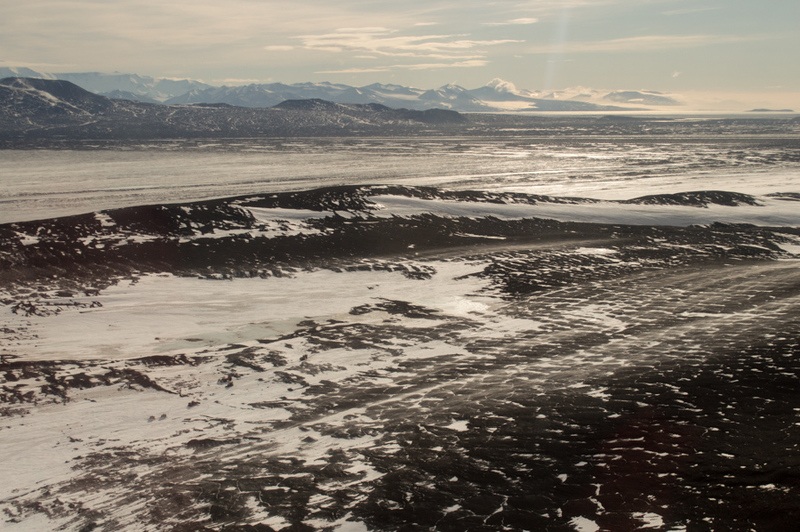 So, to close up the whole story for today, we will leave you with some nice imagery that we took on the helo flight in. 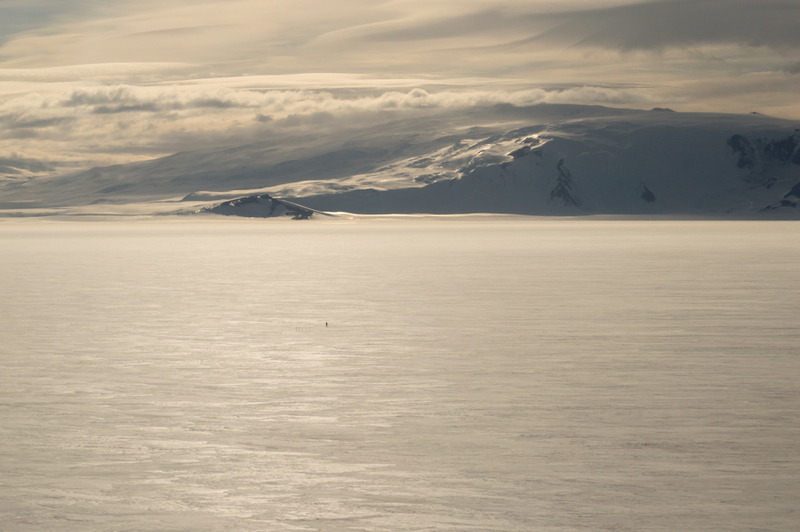 You should also get to appreciate the Antarctic beauty, like we are doing now. While cooling our arms and sore hands with ... ice, right! And in case you were wondering, we do not have an ice cube machine like they do in McMurdo. We just pick it up from the ground! Take a good look. 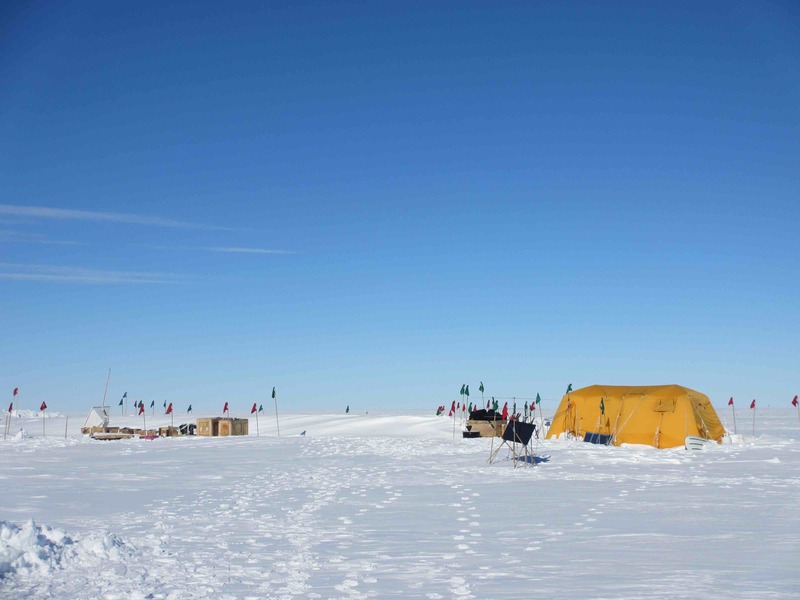 You can spot the traverse (huge tractors driving) to South Pole! One of the ARIANNA stations waiting for us! And the helicopter is setting down. As you can see, our site is very flat and featureless. 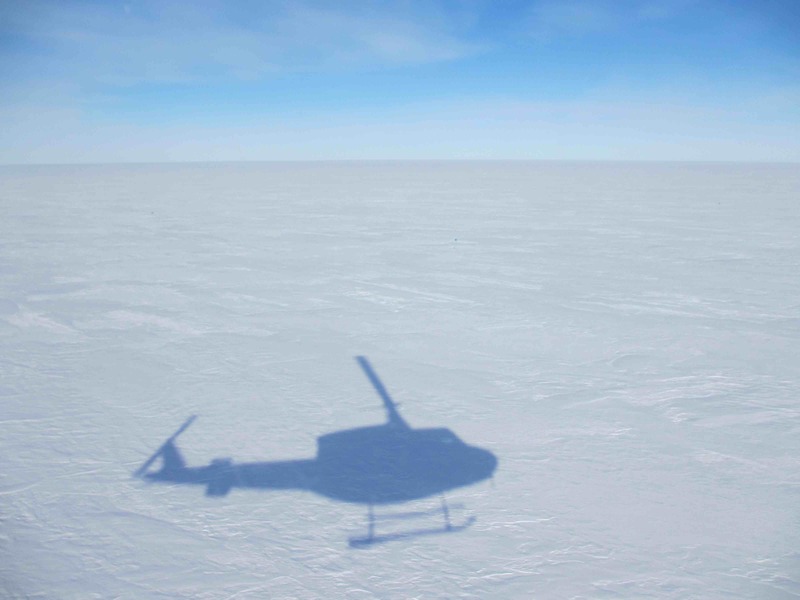 Best conditions for a well-defined neutrino array.